Whenever a wedding gallery shows up in our inbox with a dog in it, it’s so hard to say no to that submission! So we thought, in honor of National Puppy Day on March 23, why not just create an inspirational wedding styled shoot with ONLY puppies?! Of course, when we asked pet planners FairyTail Pet Care, who help include your pet in your wedding day, they were immediately on board. 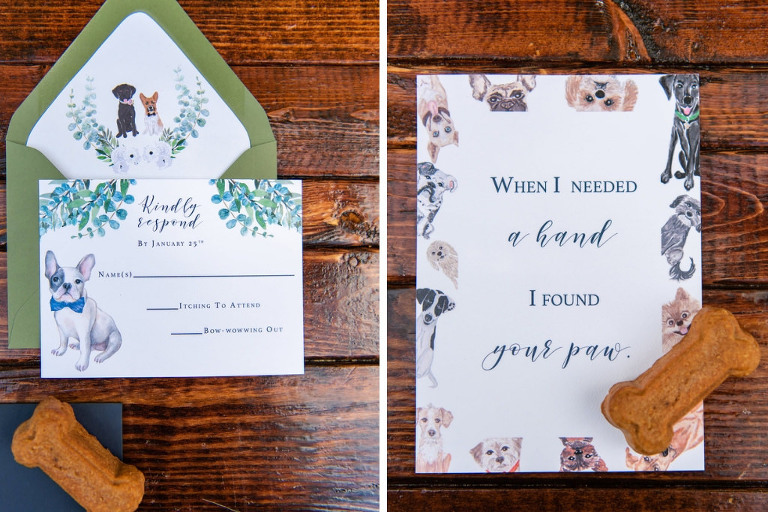 We knew we wanted to partner with a St. Pete wedding planner and designer who loved dogs, and Meagan Phillips Southern Glam Weddings & Events was top of our list! Add in the Humane Society of Tampa Bay who provided adoptable pups to use as “models,” and our “Puppy Wedding” came to life! “The goals were to showcase adoptable rescue animals as well as demonstrate how couples could incorporate their dog into their wedding day, whether the furry guests are physically in attendance or RSVPed with regrets,” Meagan of Southern Glam Weddings & Events explained. The navy blue, emerald green and magenta color palette popped against the lush bamboo garden at downtown St. Pete wedding venue NOVA 535. To add texture and contrast, Southern Glam incorporated mahogany wooden farm tables and benches from A Chair Affair with velvet pillows and linens to add a luxurious feel. 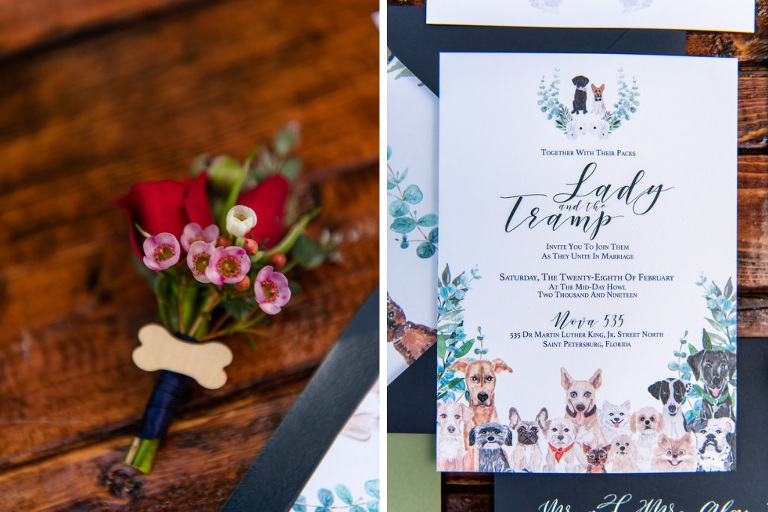 Lush greenery centerpieces with pops of color and garland runner from St. Pete wedding florist Monarch Events And Design added a boho-chic flair, while hand-drawn custom stationery from Sarah Bubar Designs tied together all of the puppy elements. The pups ended the day with everyone’s favorite part of a wedding…cake! The Artistic Whisk created a three-tier naked cake adorned with fresh fruits and greenery that adoptable dogs devoured after a long day of modeling, which all caught on camera by Caroline & Evan Photography and Kemari Lyn Films. How would you describe the theme? “Puppy love” can definitely be felt in this whimsical boho-chic styled “dog wedding” shoot. 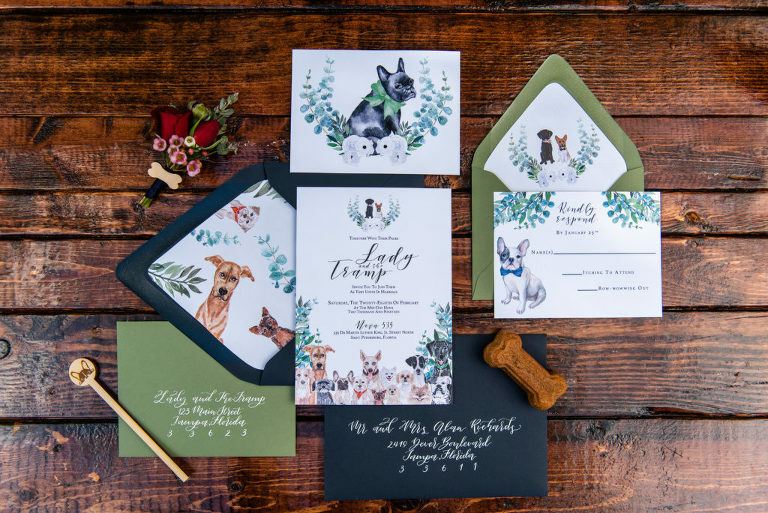 The goals were to showcase adoptable rescue animals as well as demonstrate how couples could incorporate their dog into their wedding day, whether the furry guests are physically in attendance or RSVPed with regrets. 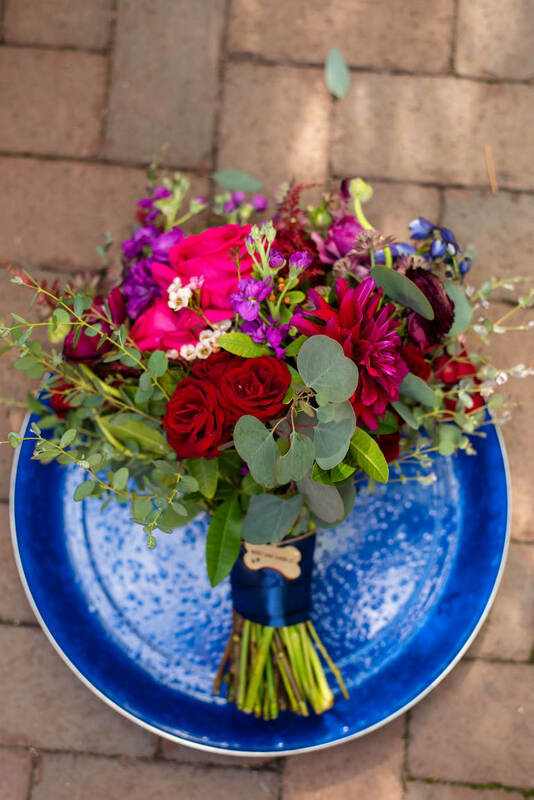 The primary color was navy, and it was accented with other jewel tones such as emerald green, magenta, and indigo which were displayed in the florals and greenery. I integrated wooden elements and gold metallics to add texture variations to the moody jewel-toned color palette. The colors and textures were chosen to compliment the natural space of the venue while portraying a luxurious design. I want to learn more about floral and decor from Monarch Events and Design. Monarch Events and Design will contact you shortly! What was your inspiration for this shoot? The shades of green and earthy wooden tones that surrounded NOVA 535’s courtyard reminded me of my summer travels to Ireland. The greenery, brick accented architecture and colorful hanging flower baskets in Dublin provided color inspiration for this styled shoot to pair with the aesthetics of NOVA 535. NOVA 535’s charming courtyard set the tone of the shoot with its natural components of lush greenery, exposed brick, and towering bamboo walls. The atmosphere was an ideal setting to bring a chic bohemian feeling to life while giving adorable puppies ample space to roam and explore. What were your favorite elements of this shoot? The reception table and farm benches with throw pillows was another favorite aspect I included in the design. This element provided a fun, yet still sophisticated, guest experience and seating option. Lastly, the perfect backdrop was provided by the boxwood wall adorned with a fun balloon installation and a personalized giant balloon. I want to learn more about planning from Southern Glam Weddings and Events.